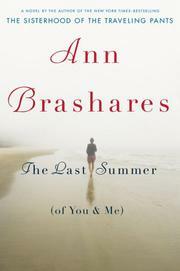 A novel about sisters, friendship, irrevocable loss, blossoming love, old betrayals and secrets, from bestselling YA writer Brashares (Forever in Blue, 2007, etc.). Clearly aimed at the author’s maturing fan base, the book opens with 21-year-old Alice sitting barefoot in the midday sun, waiting for the ferry that will bring a mercurial and beloved childhood pal back to Fire Island. Paul spent his summers there next door to Alice and her older sister Riley, forming a triumvirate that shared growing pains, fears and hopes for the future. His wealthy but wayward father, who named him for Paul McCartney, died from a drug overdose when the boy was very young. Now, his beautiful Italian mother, Lia, flits in and out of his life. As Riley, who works as a lifeguard, watches the water for those who’ve gotten in over their heads, Alice begins to question her feelings for Paul. The narrative moves back and forth between past and present, showing the three best friends balancing their daily lives with their special summers. They negotiate changing relationships, a dark secret that affects Alice’s family and a tragedy that alters everything—from their friendship to their futures. Brashares writes with a spare hand about the evolving ties between Paul and the sisters, detailing Fire Island summers with believable and easy familiarity. But the characters, although likeable, never really come alive, and neither does the novel. Slow-moving, deliberately paced coming-of-age tale oddly lacking in passion, though a built-in readership will undoubtedly want to read it anyway.